Sponsors are welcome to send packages to their sponsored child for their birthday, Christmas, or just because! Though it can be expensive, it is safe to send things to South Africa, and we have had no incidences of packages disappearing, though some take a long time to arrive! What can I put in the package? The kids love getting letters, especially ones that contain pictures of their sponsor! They also like to know things like who is in your family, what you like to do, and for some reason, they often ask when your birthday is! Clothing items such as shirts, underwear, socks, etc. are always needed. School supplies – backpacks, notebooks, pencils, pens, folders, etc. Toys, candy, and any other nick-nacks are always welcome! How long does it take to send a package? Please note that it can take anywhere between 3 and 8 weeks for a package to arrive. *Any packages sent for Christmas should be sent before October 15th in order for it to safely make it before school lets out for December holidays (usually around December 1st- January 15th). Many children go to visit family during this long break, so usually packages have to be sent with them when school closes, as we can’t guarantee that we will see them during this time. Any packages received late will be given to your child when they return to school. Please do not insure the package or get delivery confirmation – it does not help it to arrive more safely (and it can rather cause it to be opened!) and it costs us up to $80 on our end to pick up a package that has been insured or has delivery confirmation! Please do not put a high value on the customs form for the items in the package. We have to pay approx. 20% of the value when we pick up the package, so the higher value you put, the more we pay! (This form is filled out when you mail it at the post office, and stuck to the outside of the package). Be honest about the value, but don’t over-inflate it thinking it will be safer! Make sure all boxes are secure (use lots of packing tape! ), as the trip across the ocean can be a rough one, and packages sometimes arrive torn open! It is also best to put clear packing tape over the address label so that the address doesn’t wear off in transit. We will notify you when the package arrives, and try to take photos for you of the child receiving the package – however, please understand that this is not always possible, especially at Christmas time! Please remember that the important thing is that your child received it and was blessed by it! 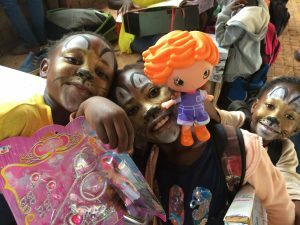 Since it is expensive to mail packages, we know that some sponsors may rather have us purchase gifts in South Africa for their child with money that they have allocated specially. This is possible – please e-mail Sarah at terweyfam@gmail.com for account details or any other package information. You are also welcome to e-mail her to ask if your package has arrived yet, or to let her know one is on the way! Please understand that all gifts must either be mailed to South Africa or money sent for us to purchase gifts for your child in South Africa – with extra luggage costs being as high as $300 per bag, we unfortunately cannot bring any gifts back from the states! Please do not feel pressured to send anything to your child or guilty if you do not, as all you provide through their sponsorship is enough! We just want to allow sponsors the option of corresponding with their child through gifts and letters!